I'm into a little phase of mostly work travel short haul in Europe now. It's interesting how the dynamic changes, I just go the most direct route possible when travelling for work, not least because we're usually booked via CWT into Y so there's no real TP incentive to hop around. However on the current trip to Malpensa I celebrated a good bonus payout by buying a ludicrously overpriced POUG in both directions. For no good reason really. But it's turned into one of those arse-end of business travel sort of trips. I was booked on the late flight to Malpensa from Heathrow, on arriving I discovered there was an hour delay, which put my time of arrival way back after midnight and left me with a very dull evening in GF to contemplate. When we finally boarded it turned out that the incoming flight from Nice had had a couple of lightning strikes and had had to go off for checking, so we'd had a replacement arranged. By the time it got in, it was well after midnight, and I had a number of Uber cancellations before finally getting to the Holiday Inn Express behind a long queue of other latecomers. It was well past one when I got to bed, a good half hour after that before I got to sleep, and I had to be up at 6.30 to get to the office for a day of presentations. That's the interesting thing really. I can deal with a 29 flight 1400 TP epic in my own time, but a quick aller-retour for work leaves me questioning whether I ever want to get onto a flight again. More so because I now officially hate Malpensa T1. I've flown from the low cost terminal a number of times, and I can cope with that more or less. But T1 is about a mile long, and I walked literally to the wrong end and back looking for the lounge. And then through passport control, which despite a long queue had 4 booths open (until one of them decided to knock off). And then the lounge itself which is pleasant enough, but which has only dried curling British Rail style sandwiches with gloopy fillings or "gourmet bites" which are vile vile vile. I can't even drink because I have to drive back from Heathrow. But anyway I thought I'd get this report in, because it's Friday the 13th, and the check in zone for the flight was 13. I did toy with the idea of moving myself to row 13 to stick two fingers up at the fickle hand of fate but I'm way too superstitious for that. In other news a couple of work trips have been added to the roster, one to Vilnius which was booked to my delight via Helsinki on BA (op Finnair) on the A350. I was expecting to be booked on LOT or LH so the fact of trying out a new plane plus having a Cathay delight in T3 was a big bonus. And then another overnight to Italy which I'll book myself and unlock the first half of the bonus Avios promotion. 1) 50 flights this year. I'm currently on 46 (44 this TP year since Feb 9th). It doesn't seem like 50 flights in fact, though I must admit last night as I was coming into land at LHR I only had a loose conception of what airport I would be at, it's all becoming a little bit of a blur. 2) Bon Jovi time ("We're half way there... oooooo livin' on a prayer"). Currently on 2450 TP, 40 to come from last night (and 40 hopefully from ORC from the US excursions, so I may already be half way to the guitar solo). Just over two months into the new TP year. It slows down a lot now from this point though, although lots of flights, they're not big earners until the PHX do, combination mostly of work and a couple of family holidays. The only fly in the ointment for the next sequence is that I've never been convinced the TP run part is ticketed properly. It looks OK, marked as paid etc, but I didn't seem to get charged for the ticket when I booked it. I've checked a couple of times with IB and BA and the travel agent, and they all tell me I'm good to go, but I won't quite believe it until I'm onboard. It was originally to try out IB business class in the A340 mostly. You have my sympathy for "which airport am I at?" Back in my travelling days I had to hop around all over our Asia Pacific region, Pakistan to New Zealand, and rather a lot of it was in Q1. Once I had convinced myself I would be landing in Singapore. A nice respite. Er, wrong, it was Jakarta. I did one trip a few years ago which involved evening presentations in 5 Indian cities in one week. We'd present, hit the sack, up at 5, travel to the next place and set up, rinse and repeat. All the arrangements were done for us, so literally we just went down the corridors we were told to go down and get into the waiting transport. To this day I still have no idea which cities I was in. Fun though. OK, BA IT is hardly the bees' knees, and the website has been pretty much non-functional for a few days, but it's like ALIEN SPACE TECHNOLOGY next to Iberia IT. Well at least it's like two IT systems in a huff with each other, and not talking. Or something like that. The first thing they were unable to agree about was the time of my flight tomorrow. IB was certain it was 20:15. BA was sure it was 20:50. IB refused to allow me to check in at 20:15, explaining it was a BA operated flight, BA said it wasn't time to check in. Eventually at the appointed hour, OLCI opened on the BA app and I went in to do it, only to be met by an error pop up telling me it was actually an IB operated flight after all and offering to pass me to the Spanish site to check in. Which, for reasons known only to itself, was now irrevocably in Spanish. I worked my way through that, having to re-enter my actual passport date to replace the old second passport data that had somehow found it's way into the booking presumably from CWL who had booked for me. And there was much cursing of systems that don't pre-populate your phone prefix from your country of residence leaving you to hack your way down a list of 907 countries where the UK is hiding incognito in the "R" section. Eventually got to a screen allowing me to save the boarding pass to my phone and download via email, so I did, pressed the ensuing pop-up and was told I'd interrupted the screen load in progress. Fortunately the email with PDF arrived, UNBELIEVABLY my exit row seat selection has stuck. I did make an attempt using the app to load the BP into the passbook, but it just took me to a screen with my old passport details so I bailed out of that. I'll use paper, and carry both passports. Despite all of that, I'm rather looking forward to flying Iberia, because I never have and it's always fun to try out a new airline. I am living testimony to the folly of allowing hope to overshadow cynicism and experience. Next day. I awoke to the offer of a 47 euro POUG on the next flight in the sequence, to Frankfurt, and although I know it doesn't help with TP, I thought it would be rude to refuse. A good experience too, again very well policed boarding, and a comfortable seat and flight. The food was an interesting contrast with BA in both good and bad senses. It all came out on a tray at once, and the peripheral stuff was pretty poor, a not very nice salad, some cheese, and a lemon cake. But the main was fantastic. PROPERLY medium rare beef fillet in a really tasty sauce. Mind you there weren't many loaded. 4 rows of business, and the poor guy in 2A was disappointed. This was because they served from both sides of the trolley, left to right, so in 2D with no row 1 on the starboard side of the cabin I got in as about number, with row 3 being done at the same time. So pour Mr 2A had to make do with the pasta - he was not pleased. I settled down with a very nice brandy and ended up snoozing, so a very pleasant flight all in all. Nice to chalk up another OW airline I haven't been on. Bit of R&R in Limburg tonight, lovely weather and I think it'll be a big steak al fresco, The half a day in the office and an afternoon off before flying to LHR on Saturday morning to pick up the second half of the trip which is basically TP related. A little aggrieved not to have been offered a POUG on the Frankfurt to LHR flight, I've had them in the path and might well take one. Will be in GF from about noon to 5ish on Saturday if anyone's about. Chugging on, and today was the 50th flight of the year (48 since the TP reset), which seems a lot more than I actually remember. 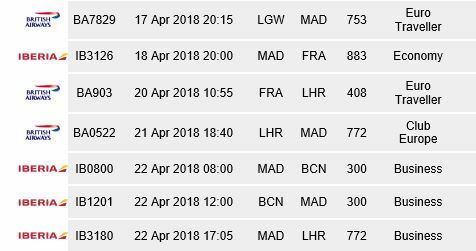 Today was the day of short haul in wide bodies, with a leg from Frankfurt in Y on a venerable (28 yo) 767, followed by LHR to Madrid on the A340 in J. And I have to say, perverse as I am, I much enjoyed the 767. Yes, it was tatty and rattly, yes the seat was stuck in mid recline, yes it had the sort of mods your grandparents did to their house in the 1970s to put new wiring in (in this case for the video screens). But it had an ineffable charm about it. I will miss the 767s when they go. I also had the rare chance to enjoy my favourite BoB offering, the bacon roll with the filter coffee, which beats any of the CE food on shorter flights in my book. In contrast the A340 was BEEEG. I don't think I've been in one before, and it was stupidly long with lots of engines. But I wasn't at all keen on the J seats. You don't have to climb over people like in BA, but they're pretty cramped unless you put your feet up. The headrest seemed very restrictive. Nice screen. The food on the short haul leg wasn't as good as BA CE on this occasion (I hit lucky last week with a steak), being an overcooked chicken roll with green beans (most of the plate was green beans) chucked out as quickly as possible. There was wifi, and they give you a free 5MB card, but it barely lasts into the Bay of Biscay before giving up. So altogether not impressed, and BA come out a surprise winner today. Not least because having cocked up the hotel booking - I booked the Hilton via BA and it turned out there was a block booking so no rooms - they've put me into the very swish Melia Barajas, which I will enjoy for a full 7 hours, mostly asleep. Tomorrow a little jaunt to Barcelona and back and then home. And no more flights for a couple of weeks, which I have to say is welcome. You should have tried LATAM between MAD and FRA - cheap business class flights and a far superior product! Your thread is great reading! I certainly want to try LATAM but was constrained this time as the initial sequence was a work booking in Y.
i need a 757 flight now, that's the only mainstream airliner I've not tried this year. May have a go on a 717 too. Do any Oneworld airlines still fly them? I might stretch a point and go non one world to complete the Boeing set. There were a lot of them in Catania. I am after all stooping to fly Lufthansa for the JU52. Seems a bit extreme to do it on Qantas as I've no trips planned to Aus this year. Also noticed with considerable glee this week that there is a heritage 'Finnish Airways' DC3 flying out of the wonderful but probably short lived Malmi airport in Helsinki so having a look at whether I can connect up with that at some point. Non stop to Aus? Total waste of TP earning opportunities. HEL-DOH-CMB-PVG-KUL-PER at the very least, surely? It's interesting to see you mentioning the DC3 flights during the summer season in Finland. There are Youtube videos mainly from landing and taking off from Malmi airport, but other interesting clips too. squawk and bisonrav like this.